From top to bottom, the East is the most complete conference in all of UWS. Mathematically, all nine clubs in the East still have a shot at the playoffs, and most have a real chance in challenging for the top spot in the East. With last year’s playoff teams (New Jersey Copa FC and Long Island Rough Riders) sitting in the middle of the conference and within striking distance, it is sure to be a whirlwind of a second half of the season. All statistics are up to date through week five of the season. Rochester sits in first place, but they aren’t in control of their own destiny. A 4-0 defeat to Connecticut could foil their plans at an East Conference title, though the remaining schedule does favor the Lancers. They finish the season with three out of four games at home against the lower half of the conference. If Connecticut drops any points in their remaining games, expect the Lancers to come out of the 2018 season as East Champions. Statistically, Rochester is led by the high scoring duo of Forward Brook Barbuto and Midfielder Elin Eklund. Both have six goals on the season! Barbuto adds two assists to give her the team lead in points with eight, while Eklund adds one assist to give her seven points on the season. The majority of the goalkeeping has been handled by Kenna Kosinski, who has played 270 minutes, giving up six goals and making 18 saves. As stated above, Connecticut holds the key to who will win the East. They have already beaten Rochester and have lost to the third place New England Mutiny, so as the Fusion go, so does the East. They do have an opportunity to avenge their early loss to the Mutiny on the last day of their regular season (July 15th). This game could be a “play in game” for the playoffs. Statistically, the Fusion are led by the Midfield duo of Tori Sousa and Hayley Nolan. Sousa leads the team in goals with 4, while Nolan is right behind her with three. Goalkeeping duties have been split by Megan Dalton (3 games played, 14 saves, one goal against) and Ashley Cavanaugh (2 games played, 13 saves, 3 goals against). For the Mutiny, the rest of the season is all about gaining ground until that last game rematch against Connecticut. It won’t be an easy road to get to that rematch as the Mutiny have to go through Western NY and a road game at Long Island. If New England can weather the storm, expect them to challenge for the East crown. Statistically, New England is led by the trio of forwards in Kate Howarth, Brenna Brown, and Sydney Brackett. Howarth leads the team in goals (4) and total points (5). Brown is second in goals with three. Brackett leads the team in assists with 3. Starting between the pipes for the Mutiny is Lysianne Proulx. Proulx has played all but ten minutes this season, saving 39 shots and only giving up 7 goals. Long Island is truly a wild-card in the middle of the East. We will know in two weeks whether they will be in the hunt for a championship, or trying to spoil the party. Their next two games are on the road against Connecticut and New Jersey, followed by what could be an important home contest against New England. If the Rough Riders can make it through the gauntlet then the race out east will get really interesting. Statistically, the Rough Riders are led by Midfielder Morgan Santoro. Santoro leads the team in goals with three and points with four. Goalkeeping duties have been split by Melissa Guglielmo and Kelsey Daugherty. Guglielmo leads the team in minutes with 225 and saves with 16, while Daugherty leads the team in goals against with two and points gained with four (one win and a tie). 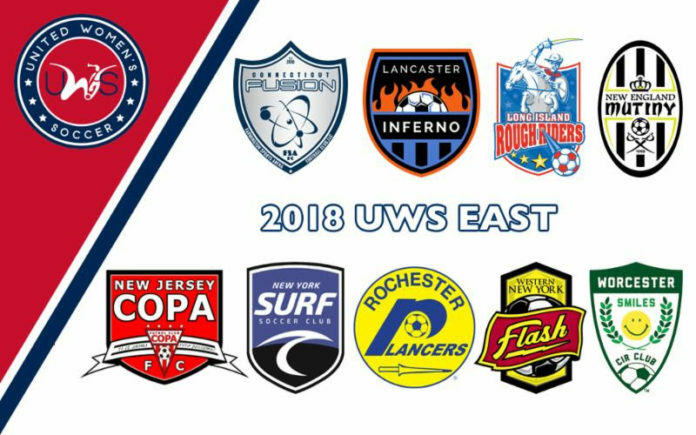 With two road victories (New York Surf was a forfeit due to scheduling conflicts) Western NY Flash has started their first three games on the right foot. They did drop vital points at home to Long Island, but it’s tough to beat a team twice in one season. Good news for the Flash is that they finish the season with three straight home games. If they can steal a few points on the road, the Flash should be in contention for a playoff spot come seasons end. Statistically, the Flash are led by Forward Carissima Cutrona, who leads the team in points and goals with three apiece. Goalkeeping is led by Alexis Bach, who picked up the 3-1 win against Long Island, making seven saves. Much like Western NY Flash and New Jersey Copa FC, Inferno Rush has put themselves into contention after their first three contests. Rush were able to avenge a 2-0 loss to Connecticut in week two by winning the home leg 1-0 in week three. Picking up points against the second place team should give the Rush momentum through their tough schedule. Games against Flash, Mutiny, Lancers, and two against Copa will be huge for the Rush’s playoff hopes. Statistically, Rush are led by Forward Tesa Mckibben and Midfielders Alexis Rostucher and Teresa Rook. Mckibben leads the team in assists with two and points with three, while Rostucher and Rook have a goal and an assist each. Kelly O’Brian has held all of the goalkeeping duties for the Rush. O’Brian has played 270 minutes, giving up four goals and making 16 saves. It’s been a tough season for the Surf with a plethora of close losses. They’ve held a lead or been tied at halftime in three out of their four losses. With already playing seven out of ten games, it looks like Surf’s hopes at a playoff birth are slim to not, but crazier things have happened. The Surf will look to improve on their close game misfortunes in their final three games. Statistically, the Surf are led by Forwards Melissa Menta and Furtuna Velaj. Menta leads the team in goals with three and points with four. Velaj is right behind her in both categories with two goals and three points. Most of the goalkeeping has been held by Colleen Hickey. Hickey has played 315 minutes with ten goals against and 22 saves. New Jersey Copa FC started the season out slow, losing at Connecticut 4-1 and drawing with Surf 1-1 at home. They look to a 2-0 home victory against Worcester to lead them on the right direction to a repeat East Championship. The next three games (all on the road) will be a huge test to see where Copa is in the conference. It all starts against the Flash, then Rochester, and finishes up against the Rush. We’ll know after these three games if it is time for Copa to hand over their crown. Statistically, Copa is led by Forward Jeanine Nunez. Nunez leads the team in points and goals with two apiece. Goalkeeping is split between Andrea Leitner and Aytana Muschajew. Leitner leads the team in minutes played with 173 and goals against with two. Muschajew leads the team in saves with nine. It’s been a tough first season for Worcester, but they were able to get their first victory by shutting down the Mutiny offense to win 1-0. Apart from that game and the first half against Rochester, the club hasn’t had too much to smile about on the pitch. Much like Genesee FC in the Midwest, Smiles isn’t just about what’s on the pitch. The club has made connections with local clubs and made connections with the city through playing at the city run Foley Stadium. It may not be bright to begin, but Worcester should be smiling for years to come. Forwards Sydney Fisher, Giana Leone, Kristina Balfoort, and Dara Spital all lead Worcester with a goal each. Spital leads the team in points with two (1 goal and 1 assist). Goalkeeper Brittany Henderson has played 344 out of a possible 360 minutes, making 30 saves and only allowing 10 goals.